Prey for Android features Camouflage, which will completely hide the app's icon from your phone. This prevents others from seeing that your device is protected, and also from uninstalling the app from the device by dragging the icon. 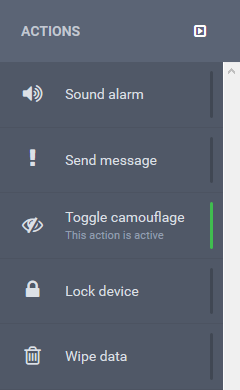 To toggle Camouflage on and off, please go the device on your Prey account. You'll see the option on the panel at the right. If you have any problem with using Prey after camouflaging the icon (if you accidentally deleted the device from your account, for instance), try uninstalling Prey on Settings > Apps > Prey and install it back again.